The Group delivered solid performance in 2018, this in spite of a year characterised by continued pressure on pricing in developed markets, supply challenges in our Anaesthetics portfolio and volatility in many emerging market economies. The overall growth in normalised EBITDA and the continued focus on working capital has lifted operating cash flow per share to 1 537,3 cents, representing a cash flow conversion rate of 105%. Sustaining our 20-year track record of unbroken growth, the Group increased NHEPS by 9.7% to 1 604.9 cents per share. We achieved base organic sales growth in our flagship Commercial Pharmaceuticals segment of 4,5%. A meaningful contribution to organic growth from China in our first full year of trade there underlined the potential of this territory. Revenues from our Nutritionals business declined as we confronted structural challenges in this sector in both Australasia and Spanish Latam. Group manufacturing revenues were lower, influenced by a major customer losing a tender. Synergy initiatives have, however, helped counter the impacts from these declines, aiding our performance through the delivery of projects aimed at enhancing cost containment in our value chain and leveraging acquired intellectual property. In the year under review, we continued to take positive steps in delivering on our strategic evolution to position Aspen as a multinational company with an emerging market bias and a focus on specialty therapy areas and established domestic brands, supported by our capabilities in complex biochemical and pharmaceutical manufacturing. In 2017, we acquired extensive anaesthetics portfolios from AstraZeneca and GSK, positioning us as the global leader in anaesthetics (outside of the United States). In 2018, our Anaesthetics portfolio is our largest Therapeutic Focus portfolio, contributing R8 332 million (19,6%) to our total revenue. In consolidating our position as a leading provider of anaesthetics products, we have focused our efforts on stabilising this business, following the integration of multiple products in multiple territories from AstraZeneca and GSK into the Aspen business. This has been supported by significant investment in establishing our commercial structures to bolster the marketing of this portfolio, overall performance has been positive, with indications of accelerating growth in emerging markets, particularly in China and Brazil. Unfortunately, supply disruptions from the AstraZeneca production network have restricted us in realising the full potential of this portfolio during the 2018 financial year. A number of initiatives have been undertaken to ensure that all possible future supply disruptions are identified early and managed appropriately where they cannot be prevented. A critical element of our strategy to extract accretive value from the acquisition of this portfolio was achieved through our acquisition of the residual rights and intellectual know-how of the AstraZeneca portfolio with effect from 1 November 2017. We have substantially completed the transfer of the contractual relationships with third-party contract manufacturers from AstraZeneca to ourselves, resulting in increased control over the supply chain and an improvement in margin. The opportunity for further value enhancement lies in the consolidation of the manufacture of a large portion of this portfolio into our own production sites. We anticipate not only margin benefit, but increased competitiveness and security of supply in this therapeutic class. This will be achieved once we finalise the extensive capital projects to increase our sterile capability and capacity at our Port Elizabeth, Notre Dame de Bondeville and Bad Oldesloe sites over the next three to five years. Emerging markets offer opportunities for volume growth as socio-economic factors, including population growth and developing healthcare systems drive expanding access to quality, affordable healthcare in these countries. We have achieved higher relative growth rates across our Commercial Pharmaceutical segment in emerging countries, which now contribute 56% of revenue, up from 52% two years ago. An important contributor to this growth is the positive performance of our Anaesthetics and Thrombosis portfolios in China, where we have made considerable investments in establishing our operating platform to support our growth objectives in this country. We have also achieved encouraging growth trends in these portfolios in Latam and Developing Europe & Commonwealth of Independent States ("CIS"). Positive performances in Sub-Saharan Africa ("SSA") and Latam have been achieved through the maintenance of a focused Regional Brand portfolio, comprising products with leading brand positioning, underpinned by strong local promotion. It is clear that we need to achieve base organic growth to drive sustainable long-term growth, building on our established product portfolios and improving the trajectory of products acquired. In spite of price erosion and increased competition in certain territories, we have achieved overall organic growth of approximately 4,5% from our base business. Maintaining and improving our underlying organic growth is a key area of focus going forward as we continually review our commercial strategies, align our product portfolio to our core strategy and explore opportunities to extract further value from our IP and product pipeline. We view the United States as presenting targeted growth opportunities for our niche women's health products. We are progressing the conjugated estrogen products with the intention to launch them in the 2020 financial year. The reactivation of Orgaran and a preservative free version of hydroxyprogesterone caproate ("HPC") are further opportunities to be realised. Focus now has turned from assessing if we have products to bring to market to determining the best commercial pathway. Early during the calendar year 2018, we initiated the strategic review of the Nutritionals business to evaluate options to enhance the value of the unique assets and IP we own in this sector. While we considered many options, we concluded that the outright divestment of this business to the Lactalis Group presented the most value to all Aspen stakeholders. As a significant player in the global dairy market, we believe the Lactalis Group is better placed to capitalise on the opportunities we have created within the Nutritionals business. The transaction presents a positive outcome for the people employed in the affected business units and the shareholders of both Aspen and Lactalis. The disposal of this business will allow us to concentrate our efforts on our core pharmaceutical business, while the net proceeds from the divestment will be utilised to reduce our gearing, also creating greater headroom and capacity. A cornerstone of our business model is to support our differentiated and complex product portfolio, through manufacture at our own sites. We have invested heavily in our manufacturing sites to evolve to more specialised and differentiated manufacturing capability in both APIs and finished dose forms ("FDFs") currently demonstrated by the extensive expansion of our manufacturing capacity and capabilities at the Port Elizabeth, Notre Dame de Bondeville and Bad Oldesloe sites already mentioned. In this year, we opened the high containment facility at our Port Elizabeth site where we will manufacture our niche high potency and hormonal products, reducing reliance on third-party contract manufacturers and ensuring security of future supply. We have also completed our strategy to address the highest SHE risks at our Moleneind site at Oss with the successful transfer of higher risk chemical processes to more modern facilities. We continue to focus on decreasing conversion costs in our manufacturing facilities, through increased volumes and operational efficiencies. Financial discipline and vigilance have characterised the way in which we have done business over the past 20 years, resulting in the protection of margins and the achievement of strong operational cash flows. We have made significant investments in IT systems and projects to enhance the data available within the Group to inform strategic decisions, while furthering IT governance and security. IT enhancement projects are ongoing over the next few years in various business units around the Group as we upgrade systems to the latest technologies and seek to further integrate our information systems. A number of targeted actions are being undertaken to further deleverage our balance sheet and to create capacity for further value enhancing opportunities. The proceeds from the disposal of the Nutritionals business will be deployed for this purpose. Further divestments will be considered where portfolios are identified which are no longer aligned to the Group's specific areas of focus. The skills, talents and energy of our diverse team of more than 10 000 people is an important driver of our performance. 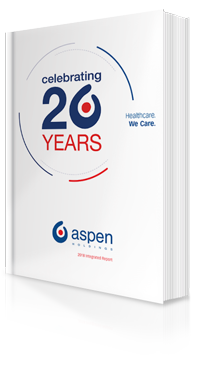 Incorporating the key areas for improvement following the global employee engagement survey undertaken in 2017, we have begun to implement our renewed human resources strategy aimed at establishing Aspen as an employer of choice. We are unrelenting in our efforts to create a value-based culture, where our employees deliver their best work, united in the vision to provide high quality, affordable medicines and nutritional products to patients and consumers worldwide. I am sincerely grateful to every Aspen employee, past and present, for his or her contribution to the ongoing success of Aspen. We are committed to our duty to act as a responsible corporate citizen and endeavour to build trust-based relationships with all of our key stakeholders. This is foundational to our behaviour and embedded in the way in which we conduct our business. We continue to cooperate fully with the European competition authorities in respect of their pricing enquiries. Furthermore, we have acted decisively in dealing positively with the significant environmental, health and safety challenges that we inherited. I wish to reiterate our firm commitment to acting with unflinching integrity at all times and to practise sound governance, underpinned by open and transparent communication. 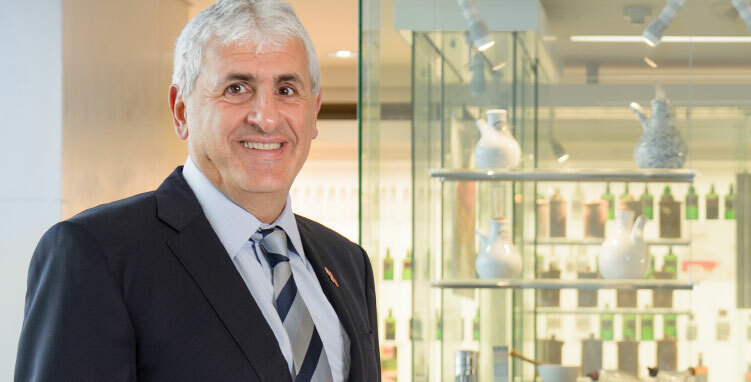 We have made considerable progress in building a strong base to support our focus on achieving organic growth in Commercial Pharmaceuticals, with emerging markets being the key growth driver. Anaesthetics performance will still be impacted as the supply constraints continue into the 2019 financial year. We are targeting positive organic revenue growth in our Commercial Pharmaceuticals segment for the 2019 financial year. We are intent on delivering positive commercial outcomes, exercising disciplined cost management and maintaining strong operational cash flows. As we look forward to the next 20 years, I take this opportunity to express my thanks to Gus, the rest of the executive management team and every Aspen employee for their hard work and dedication to the Group. I also thank each of the non-executive directors who have served on the Board during this time as their valuable contributions have played an integral part in building Aspen into the organisation it is today.